Synposis: After her husband and daughter are killed in a car crash, a grief-stricken young woman attempts to live a life of pure freedom, without a past, property or identity. Is it possible to live a life of total liberty, to live selfishly, unencumbered by your past? Can two people really be equal in a relationship? And what is required of us to live – and love – in a community? These were the questions that director Krzysztof Kieslowski and co-screenwriter Krzysztof Piesewicz tackled in the magnificent ‘Trois Couleurs’ trilogy, their philosophical exploration of the colours and themes of the French flag: Blue (Liberty), White (Equality), and Red (Fraternity). It has been just over twenty years since the Trilogy. 2014 is also the hundredth anniversary of the start of the bloodshed of World War One, which seems to me a good reason to revisit three Polish-French films that explored the idea of European unity. Looking back, it seems inevitable that Kieslowski and Piesewicz would collaborate on something like this. They first met in the 1980s during the Solidarity trials in Poland. Piesewicz was a lawyer, and while he had no writing experience, he had dramatic ideas about justice and morality that stemmed from his experience. Kieslowski had made several documentaries, but was increasingly drawn to fiction. They made several films together, including ‘The Decalogue’, a series of ten films for Polish television that explored the meaning of the Ten Commandments in the modern world. Two of the episodes were expanded into features, ‘A Short Film About Love’ and ‘A Short Film About Killing’. Kieslowsi and Piesewicz were interested in morality, but they were not moral or judgemental filmmakers, and ‘A Short Film About Killing’ is uncompromising and almost clinical in its portrait of homicide by both individuals and the state. Stanley Kubrick thought ‘The Decalogue’ was the only cinematic masterpiece made in his own lifetime. 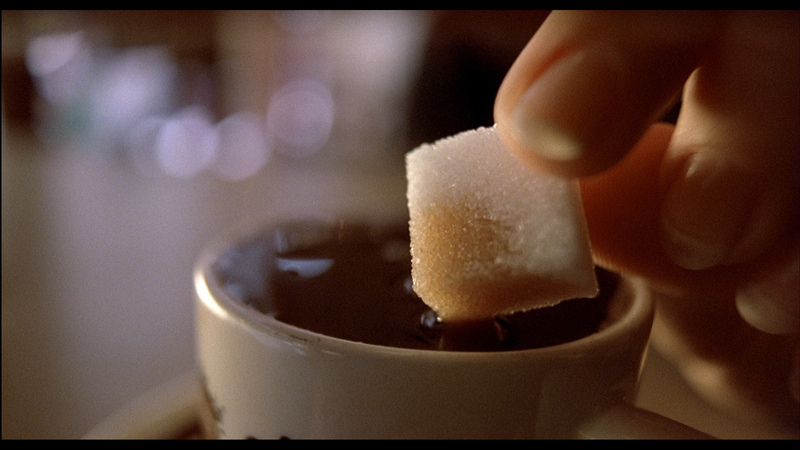 Kieslowski and his crew worked very fast: the three films in ‘Trois Couleurs’ were made in less than nine months. There are many connections between them, and it is possible – indeed desirable – to view them as one long movie. But each can be viewed as a single self-contained film. 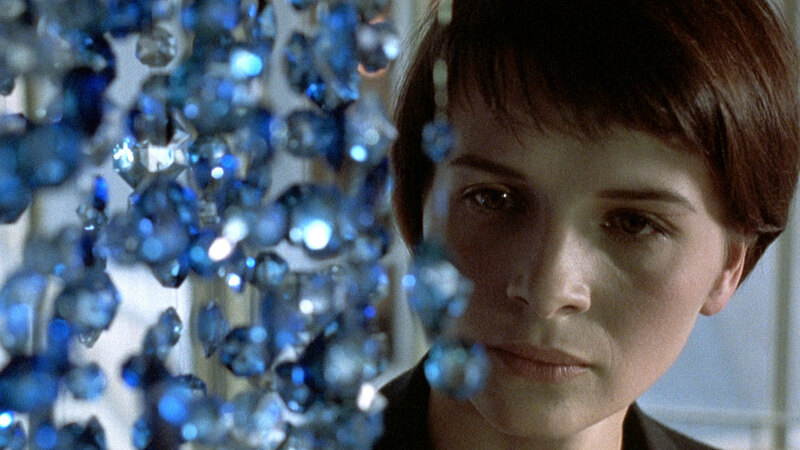 In ‘Bleu’ Juliette Binoche plays Julie, whose husband and daughter have been killed in a car crash that has also left her injured – specifically with distorted vision. Our first glimpse of her is a close-up of her eyeball, a doctor reflected in it as he tells her of the accident. Because her sight is damaged, several shots from her point of view are blurry, as in the introduction of Olivier (Benoit Regent), her late husband’s assistant, and the film’s love interest. Love interest? Yes, it’s as good a description as any, but it seems also rather vacuous. ‘Bleu’ is a love story of sorts, but the love is mostly one-sided (from Olivier). Julie mourns her husband and daughter in a way that appalls those around her. She won’t – or can’t – cry. She cuts herself off from everyone, from her past, and from her neighbours, in an attempt to live at liberty, for herself alone. Her husband was a famous composer whose final concerto – a musical piece to celebrate European unity – remains unfinished. She gathers his music sheets and throws them away. She instructs her lawyer to sell off everything she owns, including her beautiful country house. Only two things remain: a blue mobile from her daughter’s room, and a mattress. She summons Olivier to join her on that mattress, in what he probably assumes will be the beginning of a beautiful love-affair, but which for her is a finale. She disabuses him of any romantic notions. “I appreciate what you did for me. But you see, I’m like any other woman. I sweat. I cough. I have cavities. You won’t miss me.” She takes the mobile and leaves, deliberately scraping her hand on a stone wall, perhaps to feel something. 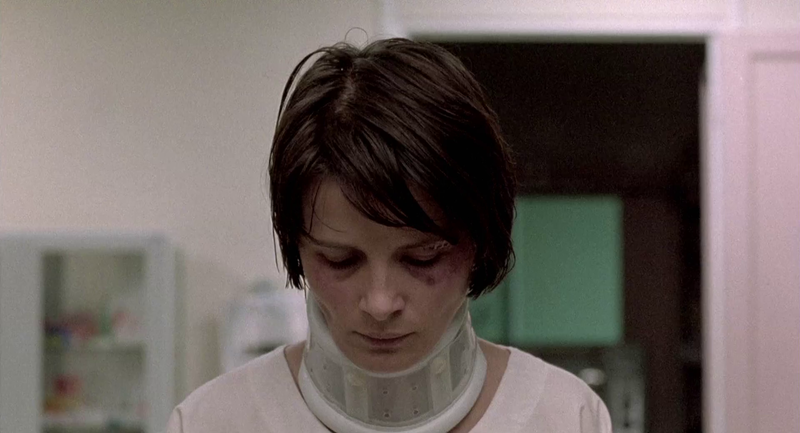 To Kieslowski’s horror, Binoche insisted on doing this for real, and it’s a difficult thing to see someone bloody her knuckles this way. Julie, now financially independent, reverts to her maiden name and lives a life of quiet simplicity in Paris. She exists rather than lives, but it isn’t a bad existence. Her apartment is spacious and filled with light; the neighbourhood is rather chic. She waits until the swimming pool is deserted so she can swim alone. She is a regular at a nice café, and sits in the sun daydreaming. Music is used sparingly in the film, but when it is used, it is as overwhelming as the colour blue. At times only Julie can hear it: she traces her fingers along the notes on a music sheet, the edges of the frame blurred because of her bad vision, and we hear what sounds like a heavenly chorus belting out on the soundtrack. We’re told that what the choir sing will be especially relevant to the Greeks; Kieslowski doesn’t explore this idea too much: is it because Greece is the locus of European civilization? According to critic Annette Insdorf, they’re singing from St. Paul’s Epistle to the Corinthians, a letter about how little a life means without love. Zbigniew Preisner wrote the score before the script had been finished, which prompts a question: did Kieslowski make the film the way he did because of the music? As with most of Kieslowski’s work, the director collaborated with practically everyone involved, asking for their input and opinions on the look and feel of the film. A film was a piece of machinery, and he and his cronies were the engineers putting it together. 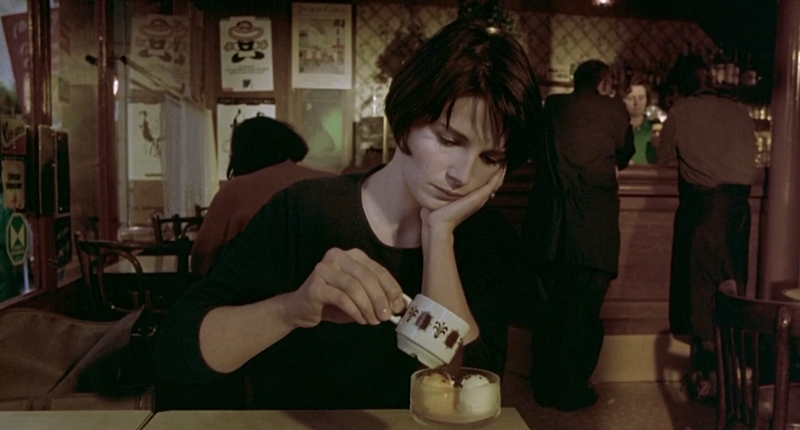 ‘Bleu’ is an astonishing film about grief and the solace of Art, filled with important little details and memorable imagery (the underside of a car as it hurtles along; the play of light on Binoche’s face; a sugar cube absorbing coffee; a mouse and her newborn babies; a sudden blackout as Julie closes off her mind to us). It’s anchored by an amazing performance by Binoche; there isn’t that much dialogue, and watching it again, you notice how much of the film’s mood Binoche has to carry silently on her expressive face. It has connections to the other two films in the Trilogy, most explicitly when Julie visits a courthouse and we get a glimpse of the two protagonists from ‘Blanc’. It has been a long time since I have seen this trilogy Niall, and your excellent review has prompted me to revisit the films, when I get the chance. 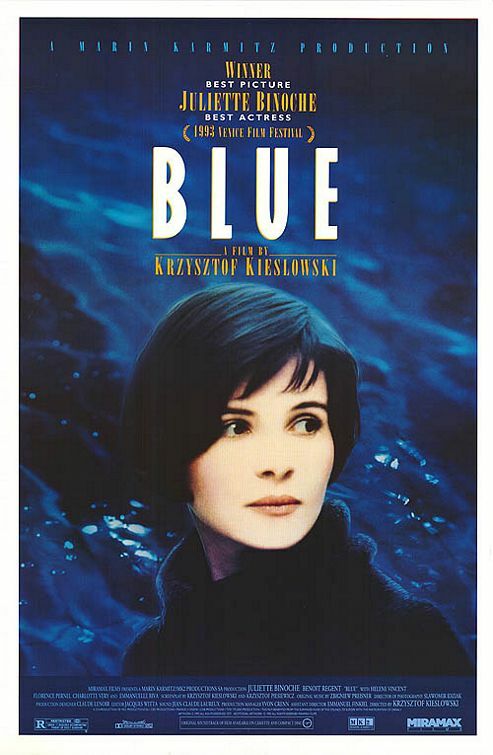 I do remember ‘Blue’ better than the other two, and I think this is because of the standout performance of Juliette Binoche. If any readers have never seen these before, this is a good reminder to rectify that omission. One of the most important works of modern cinema, you will soon see styles and effects that have been ‘borrowed’ by many other famous directors (and actors) since. cheers, pete. i imagine most people remember ‘Bleu’ more than the other two. my thoughts on ‘Blanc’ and ‘Rouge’ will be up next week. Look forward to those jogging my memory! Have a good weekend. Reblogged this on silence cunning exile … maple syrup .